Each morning before we begin our home school work and adventures the kids and I read a daily devotion. This year we have been reading the book Jesus Calling. For some reason yesterday we did not read our devotion that morning. I suspect that our morning was thrown off by the appointment we needed to keep. Yesterday I wrote a blog post about the bumps in the road. You need to read it here before going any further. So last night as we were settling into bed I remembered that we’d not yet read our devotion for the day. We all climbed up in Joshua’s bed to read it and to have bedtime prayers. I opened to the date and found the exact same verse that I that was on my heart when I wrote the blog post. 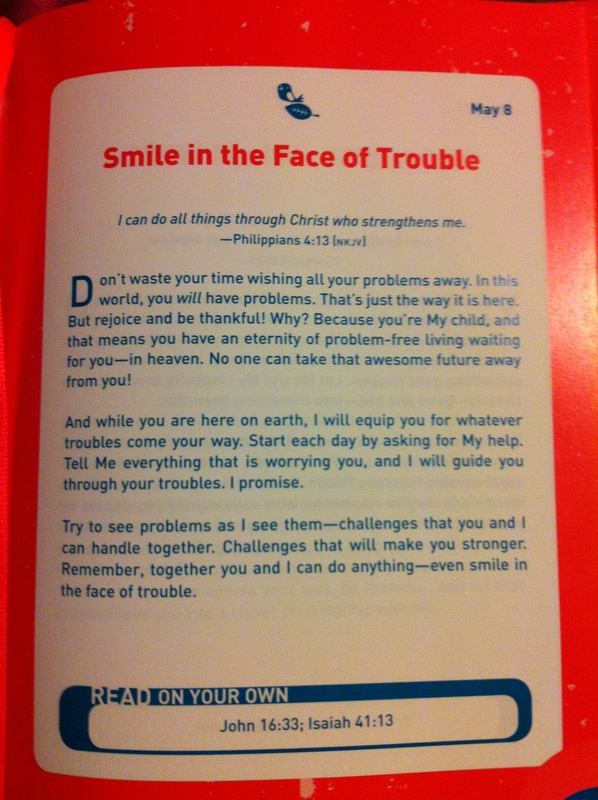 Here is a photo of yesterday’s devotion from the book Jesus Calling for kids by Sarah Young. John 16:33 is the verse to read at the bottom of the page. Just like yesterday’s blog post. “I have told you these things, so that in me you may have peace. In this world you will have trouble. But take heart! I have overcome the world.” Jesus doesn’t promise an easy road, just that He will be right beside us guiding us all the way. Take heart if your road is bumpy today. He has a message for us all.